Did anyone else feel like the summer was just a blur? Where did it all go? I seriously feel like it just got started a couple weeks ago. For the month of August, the #12Bloggers team (myself and 11 other awesome bloggers) are sharing recipes with the theme of Back-to-School Snacks. Some are easily portable and can be packed for school lunches. Others are perfect for an after-school snack. Check the end of this post for their links. 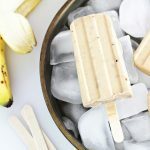 For my contribution, I am sharing Peanut Butter and Banana Yogurt Pops – a healthy frozen yogurt popsicle that has only 4 ingredients. I made popsicles because when the kids go back-to-school in our area, there weather is still HOT. Like 100 degrees F and above hot. When kids get home from school, these will surely be a welcome treat. These Peanut Butter and Banana Yogurt Pops are insanely delicious and so perfect for anyone that loves peanut butter. Nearly everyone in my house is madly, deeply in love with peanut butter so these were a HUGE hit in my house. 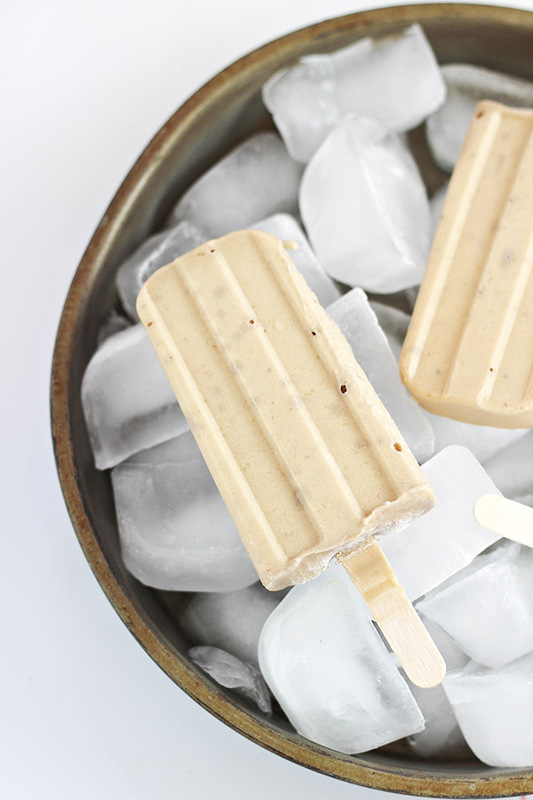 The entire Peanut Butter and Banana Yogurt Pops mixture is made in a food processor, which makes these really easy to throw together. You could make up a batch the night before, freeze them, and by the time the kids get home from school, they will be ready to go! 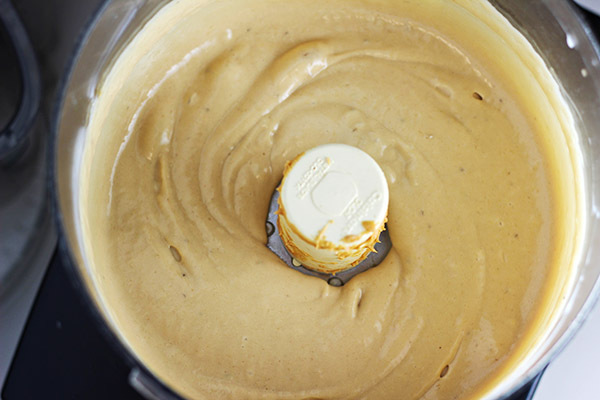 Here’s how you make them: everything is placed into your food processor bowl, except the honey. If you don’t have a food processor, you might be able to use a hand mixer or possibly a blender, but your results might vary from mine. It’s processed until very smooth. Then, give it a taste. If you want it a bit sweeter, add some honey. I added 2 tablespoons to my recipe, which I think was perfect, but if you prefer to not add any honey, these will still taste great. Of course, the riper your bananas are, the sweeter these will be too. Spoon the mixture into popsicle molds. I have the Norpro Ice Pop Maker , which I love because I can make up to 10 popsicles at once and I can use wooden popsicle sticks, which I prefer over plastic ones. Give the bottom of the popsicle holder a few taps on the kitchen counter (this helps air bubbles to come to the surface) and add your sticks according to the instructions of your pop mold. Now they are ready to freeze! Place in freezer and freeze until frozen. Place all ingredients, except the honey, into your food processor bowl. Process until very smooth. Taste test the mixture and add honey according to taste (I used 2 tablespoons). Spoon the mixture into popsicle molds and add sticks according to the instructions of your popsicle mold. Place in freezer and freeze until frozen (overnight is best). 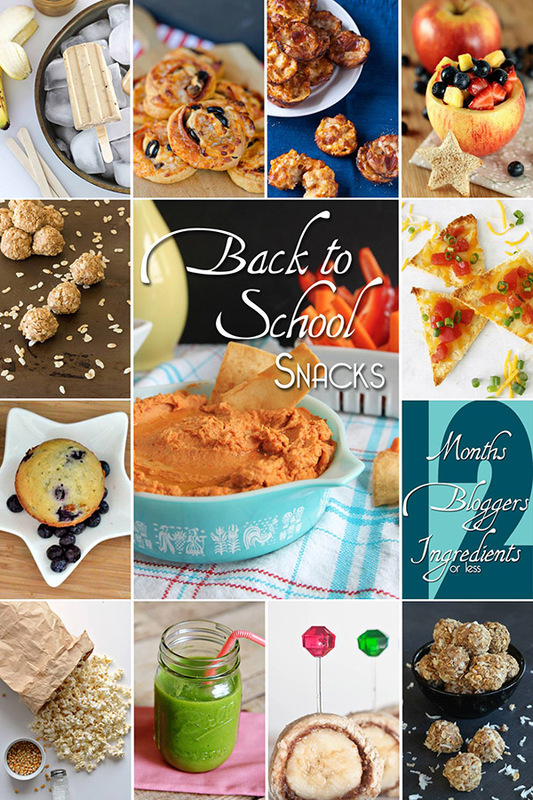 Want more Back-to-School Snack recipes? 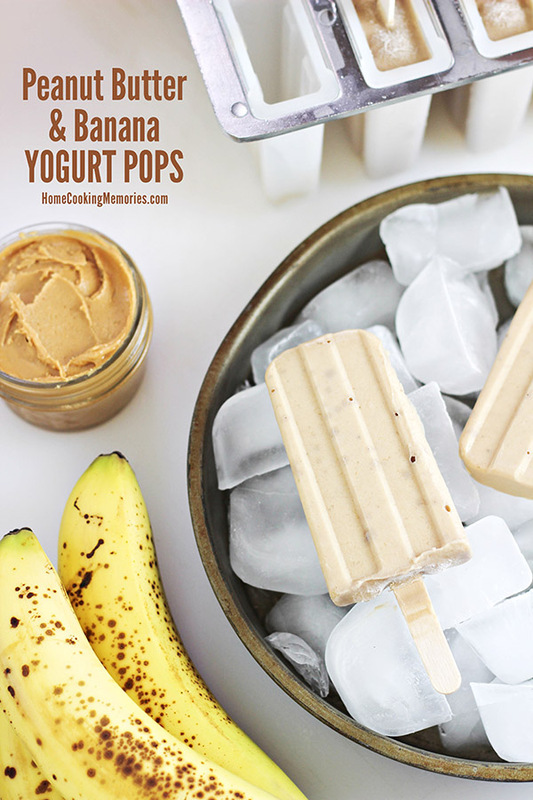 Now that you have my Peanut Butter and Banana Yogurt Pops recipe, go check out the rest of the #12Bloggers to get their Back-to-School Snack recipes! There is so much good stuff here! Wonder what I could substitute for bananas? My hubby hates them. ☹️ Thanks! You say you love the Norpro because it make 10 pops but the recipe is for 8 pop. Does the recipe make 8 or 10 pops? The recipe is correct as listed — it makes 8 pops. MMM Yummy! My kids would love these. Thanks for sharing with us at Family Joy Blog Link Up Party this week. Have a wonderful weekend. Hope to see you on Sunday for the new party! 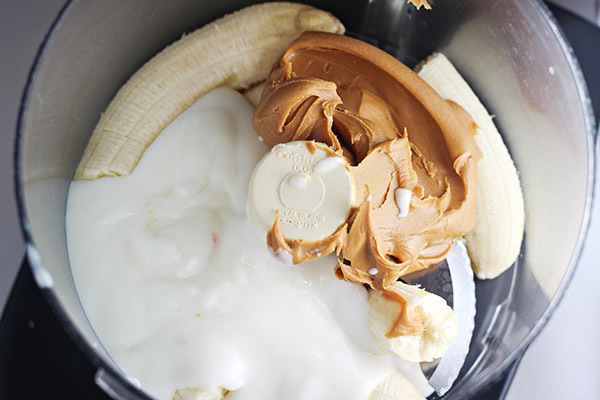 Peanut butter and banana is such a yummy combination! Thanks for sharing with us on the Monday Funday Party! These look so good! I am pinning these now. This sounds really good AND healthy! Pinning so we can give them a try this summer. Did Elvis eat peanut butter and bananas together, or am I on the wrong track? Cause I really want to call these Elvis pops and eat them all up! 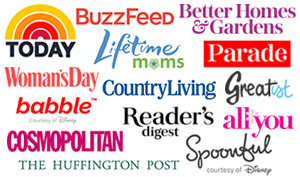 I featured your post this week at #FoodieFriDIY – thank you so much for participating! These are the kinds of treats that my kids would go crazy for! Thanks for linking up with What’s Cookin’ Wednesday! This looks so yummy, I need to try this out! With the weather we’ve had lately, I need a cool, healthy snack like this! Found you at SITS Sharefest! YUM!! I love peanut butter and banana anything! These look SO GOOD! I’m going to stumble and pin this for sure. Found you from the Weekend Retreat Link Party! I just made these – and they are delightful! What a great way to use up bananas! I featured this recipe in my Saturday Spotlight Series post today – I think my readers will love it! Thank you, Susan! I’m so glad you enjoyed them. Thank you for the feature too! These look delicious and I’m definitely going to be making them all summer! Thanks for sharing your recipe. I’ve included your post in my Five on Friday roundup. Have a great weekend! Wowie wow! These looks amazing. Pinning to make later this summer! Those are really yummy looking pops! And those are cool looking pop molds, too. Thanks for sharing your yogurt pops recipe at #SmallVictoriesSundayLinkup ! I was just wondering what to do with the bananas on my counter. Now I know! Pinned – and going to make these right now!! Thanks so much, Susan! I hope you like them. Nice to find desserts with no chocolate (since I can’t have chocolate) These sound great. Pinned it and will have to try it. Gosh do these look amazing! I can’t get enough bananas or peanut butter! What a healthy summer treat. Definitely keeping this in mind for next summer. Thanks for sharing. 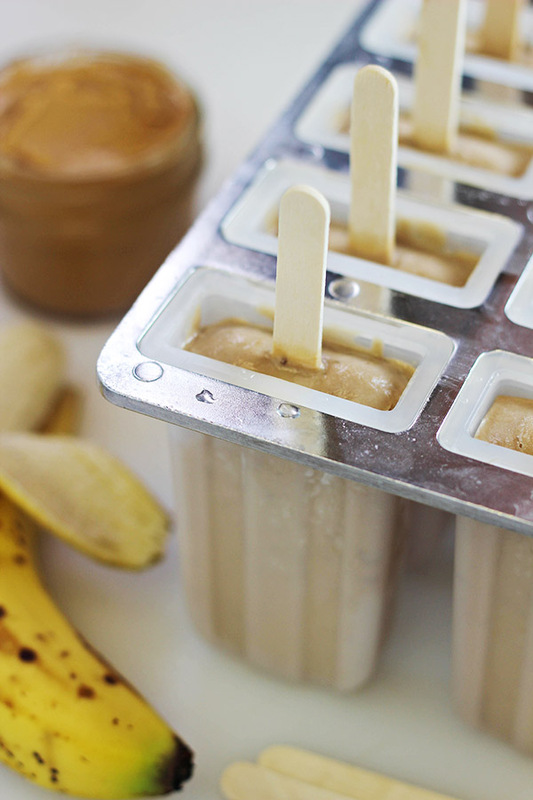 How have I never tried Peanut Butter and Banana Yogurt Pops?! They look amazing! I just got new popsicle molds! I am making these asap! Yum! We eat a variety of popsicles or yogurt pops all year round. This is one flavor combination we have not made yet and I can’t believe it. Some of our favorites combined into one! Oh now those look absolutely delicious! I adore peanut butter and bananas! Yum! what a delicious and healthy treat! They look super easy- my kids would be all over them.